Riverside dining at Pontocho - no, no, this is NOT where we dined!, originally uploaded by Camemberu. 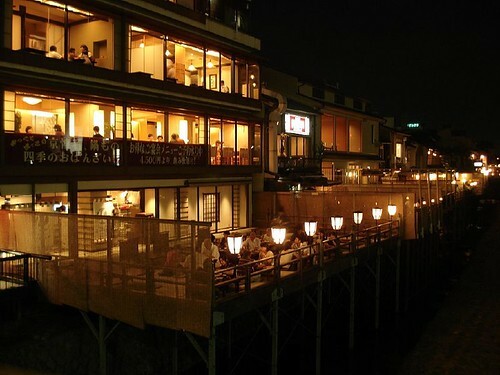 Kyoto's famous dining alley Pontocho looked really gorgeous with soft-lighting riverside dining. However, most of the restaurants seemed a bit too intimidating for us, so we didn't try any there. Gion itself was a major letdown, just a seedy strip (with no geishas in sight, of course). We didn't stay long there. Kushiyaki Monogatari, originally uploaded by Camemberu. We ended up back near Teramachi, and out of tiredness, settled for Kushiya Monogatari for dinner. 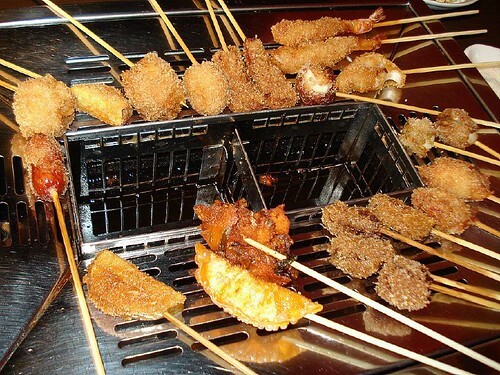 It's a casual all-you-can-eat place where you deep-fry skewers of food at your own table - choose from various meats, shrimp, scallops, vegetables, mushrooms, even gyoza, rice cakes and cheese sausages (refillable batter and breadcrumbs provided). Salads, desserts, fruits and other fillers (rice, udon, soba) also available. I have never tried DIY kushiage before, so this was interesting. Food is not the point here, I think. It's more of a social activity. Massively popular with groups (especially boisterous schoolkids) but they do set a time limit (90 mins) for about ¥2,500. There's an all-you-can-drink option (¥1,050) too, you can add on to the meal. 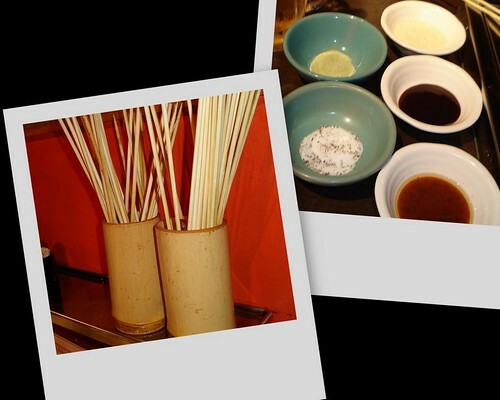 kushiyaki skewer count and the various dips and flavoured salts, originally uploaded by Camemberu. After a while, most of the fried stuff ends up tasting the same. But they have cleverly provided more than a dozen different dipping sauces and flavoured salts to vary the taste. I think we counted 58 skewers in the end, but all were bitesize portions. Strangely enough, I liked the fried rice and noodles quite a bit, and the salads provided a refreshing change in between oily bites.